The first thing to do if you would like to learn to skydive is to read all of the information you can about the sport. The next thing you must do to learn to skydive is locate a company with fully certified instructors. This can typically be done through the world wide web or your copy of your local yellow pages or a nearby city's business pages. It is also possible to call the United States Parachute Association, and they can recommend a good company in your area to help you learn to skydive. You must also decide on which type of training you want to engage in. One way to learn to skydive is to take a tandem jump. 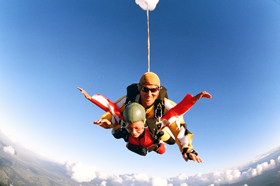 During a tandem jump, you will be strapped to an instructor who will guide you step-by-step through the jump. While you are required to take a brief training session, you will also get to jump the same day. Another way to learn to skydive is to take static line lessons. During a static line lesson, the student undergoes four to six hours of serious training before the jump. The final jump takes place with a static line attached to the aircraft. The line deploys the chute for the jumper, thus eliminating concerns that the inexperienced jumper will not open his chute at the correct time. A final way to learn to skydive is to take free fall lessons. During this type of instruction, students undergo several hours of training. They make their actual jump with two instructors, but get the opportunity to experience a fifty second free fall by themselves. While learning to skydive, it is important to ask any questions you have of your instructor. Skydiving is a very dangerous sport, but it can be very fun if proper safety precautions are taken. 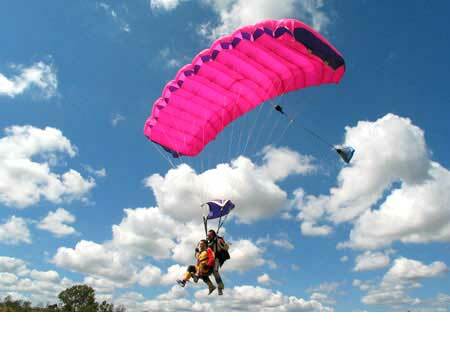 Lessons by certified instructors can help one learn to skydive.